Counting down to your yoga training – then you find out that you’re pregnant. All of that yoga practice truly pays off when you find yourself contorting to pee on a stick with minimum spillage. Then all you can do is breathe in, breathe out, and wait the two interminable minutes to learn if you’re about to begin Seventh Series. Both Annie (me) and Lizzie have assisted TTCs while pregnant (at 2,3, 6 and 7 months). Let us share what we’ve learned. Pregnancy is an extraordinary journey that shifts something deeply inside us. But if it comes at a challenging time, then know that you are not alone: no-one ever has nine months just to be pregnant so we all find ourselves in a dilemma of some sort. As for whether it’ll be good to do a TTC while pregnant, let’s take a look at some things to consider. 1. Discuss it honestly with your doctor and the teacher. The advisability of attending the TTC will very much depend on how your pregnancy progresses, your foundation of physical practice, and your state of mind: are you in a strong, contented place overall to manage the emotional upheaval of a TTC on top of the upheaval of pregnancy? You are best placed to judge this, but your doctor will advise you based on experience of supporting many pregnancies, and the teacher will advise based on the specific course (and they need to know. Sharing your news and concerns will not affect your eligibility to participate on any quality course). 2. The changes ahead may outpace your speed of adapting: be guided by your trimester. For me, participating in a TTC while six months pregnant was a beautiful experience. I had not expected that to be the case. First trimester can be grisly however. In mine I could barely practice for two months and never thought I would be “me” again. It is the riskiest phase of your pregnancy, and for many women is exhausting and frankly a bit miserable. If your TTC falls in your first trimester, postpone it if at all possible. Second Trimester is the golden phase. You will be more tired and uncomfortable than many of the other students, but no longer is your baby simply taking your energy: she is also hers sharing with you. I hadn’t thought of this before, and cherished radiating with our “double energy”, feeling gloriously abundant. I began to really bond with my bump. In the morning chants I’d sing to her. The meditations were a time to return to my instincts and deeper truths. 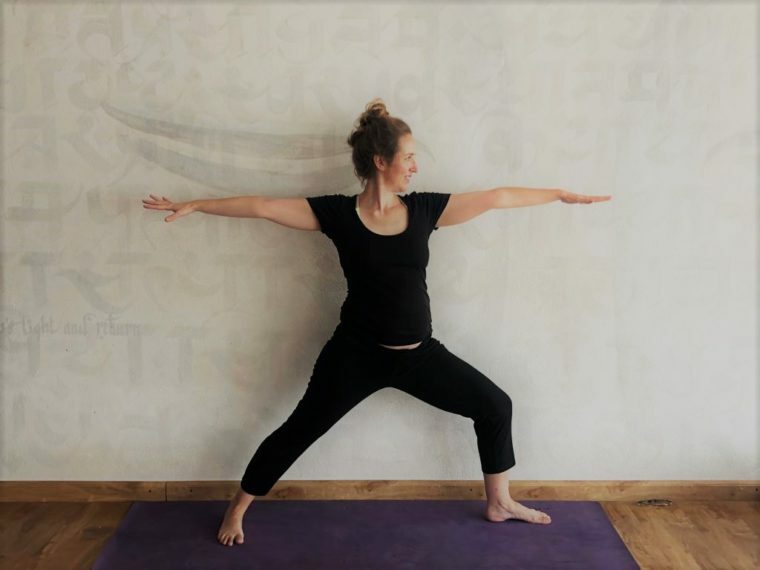 The asana helped me to connect positively with my changing body and kept away the pregnancy pains. Over brunch I’d sit in the sunshine and journal the journey. And the strong community around me made me feel protected and spiritually tribal. Early third trimester can be similar. Participating in a TTC module in my pregnancy weeks 29-30 was a sanctuary and joy. 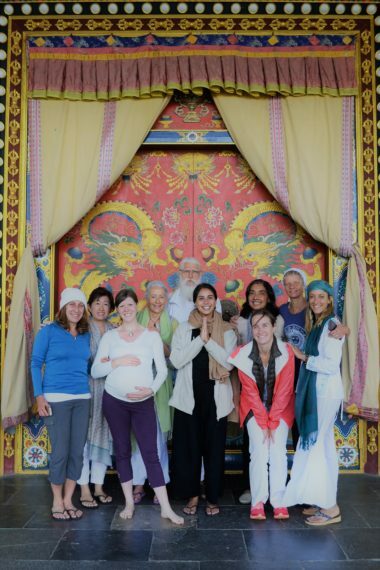 We host our TTCs in a Buddhist monastery in the Himalayan foothills, and retreating there for practice, teaching and supporting the students was profoundly calming and nourishing. This was such a gift at a time of so much change in my life. If your TTC falls in late third however, discuss cancellation with your teacher. It is time to be close to where you want to deliver, and to be ready for any early namastes with your baby. Even for nomadic mommas like me who are comfortable to take things to the last minute, the annoying truth is that by late pregnancy your brain has restructured (the infamous “preg-head”), causing lapses in attention and memory and significant – though not permanent – declines in cognitive skill. 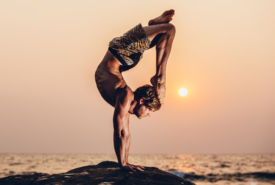 Apart from how tired you will be, and how uncomfortable and risky it can be to do several hours of strong asana each day, this is not a good time for an intensive study of anatomy, philosophy and Sanskrit. 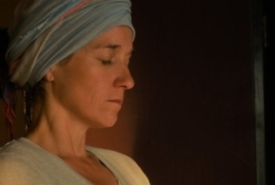 If your TTC is more of meditative and self-reflective however, such as a Kundalini Level 2 course, it can be an extraordinary tool to support the changes you’re experiencing. Note: Flying long haul to get to your course should be fine if you take the right precautions (compression socks, aisle seat, plenty of water) and your doctor has approved it. Just check your dates for your return flight: many airlines won’t let you fly beyond 28 weeks for long haul. 3. Learn about what is and isn’t safe as a pregnant practitioner. Go well informed so you can intelligently modify your practices. 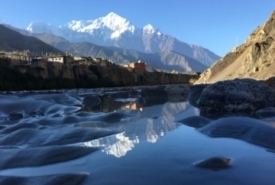 Practice with awareness and without ego, and your body will guide you: there will come a time when you know you can’t be on your belly any longer, savasana on your back will stop feeling good, twisting will cease to be an option as you grow, you’ll be too breathless for khumbakas, etc. Take notes of what you experience – your pregnancy will teach you to become a better teacher. If you have any complications in your pregnancy or fall into a “risk” group, discuss doing any asana at all with your doctor. 4. Maintain your practice as best you can before the course. This is good advice anyway for your pregnancy, but you need your stamina and strength so you can get enough out of the practices to learn to teach: your prime role at the TTC. The days are long, packed from dawn until night, and you need to be able to stay present. This won’t be easy as you become more tired, uncomfortable and less mobile as your bump grows, so maintain the foundation beforehand. 5. Take care of the practicalities. Make sure you have clothes that will fit as you grow throughout the month. Check beforehand to be sure the kitchen makes every meal balanced and nourishing. Bring your prenatal vitamins, including extra calcium, plus nuts for pre-practice protein, prunes to keep you regular, and any treats you might crave. If meals are served as a buffet, pace yourself so you don’t get heartburn. Ask the yoga centre where the nearest good clinic is. With us, it is an hour away, so you need your doctor’s approval that you are not a high-risk pregnancy. Go to bed early – you need more rest to help your baby thrive, even if you want to stay up and be part of the evening community discussions. Discover the joy of being in sync with your circadian rhythms. Be ready to accept this and to adapt your practice with humility and responsibility. I missed my partner more than I ever have for example, and he missed me – us. Discuss coping strategies together in advance. 7. All pregnancies require a bit of life-reorganisation so you’re not alone. Your options and the people they affect are often more flexible than you’d thought. It can sometimes feel like life has shrunk in terms of your choices, your finances, your freedoms. But the growth, empowerment, opportunities and self-discovery that you’ll experience on the journey is unparalleled – your world is about to expand in a way that redefines your experience of this life. 8. Most of all, know that having a pregnant lady on the TTC is a privilege for us all. Your presence contributes a great deal – bringing out the best in the student community as a loving, supportive group, and giving other students a chance to learn about modifications. And you give strength and confidence to others, “demystifying” teaching pregnant students which can be a fear for a lot of new teachers. 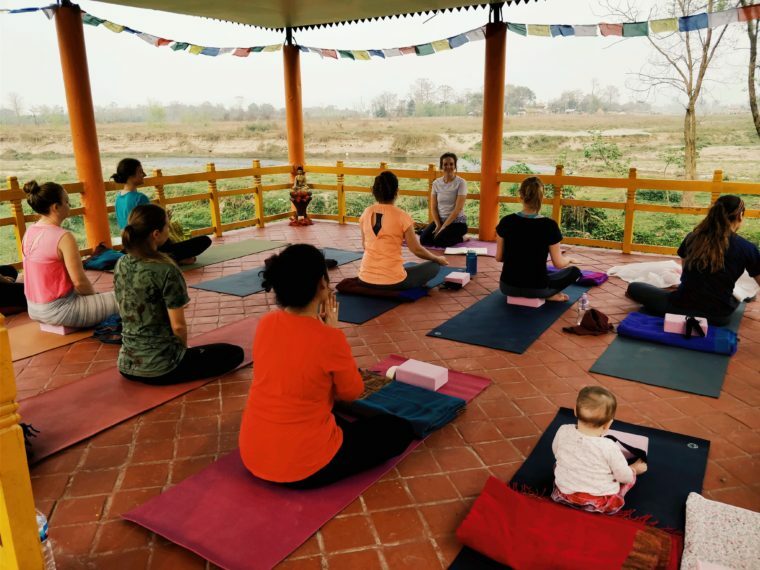 Have YOU experienced yoga training while pregnant? Share your experiences with us so we can update this as a resource for nervous new mums! And for our pregnant students: if you get the all-clear from yourself, your doctor, the teacher and your family, then consider yourself a very welcome member of a TTC community! 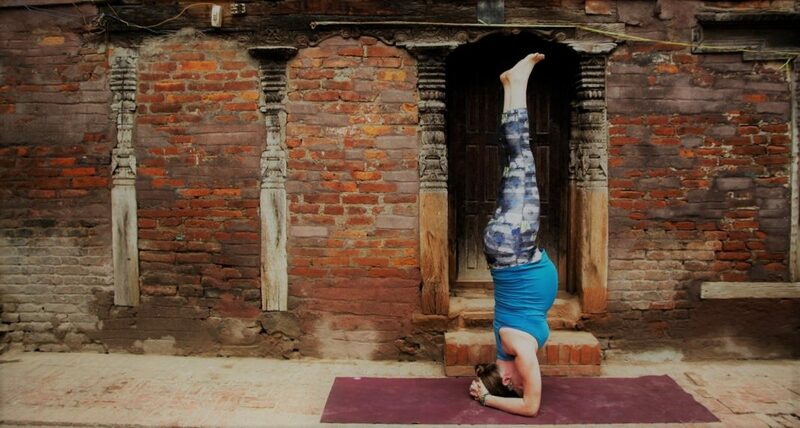 Annie and Lizzie will next offer their 200 hour Yoga Teacher Training course in Nepal in September 2019. Enquire now for availability.